I was embarrassed to discover today that I never got around to writing a full blog post explaining our work studying the properties of the red spirals, as I promised way back in October 2009. Chris wrote a lovely post about it “Red Spirals at Night, Astronomers Delight“, and in my defense new science results from Zoo2, and a few other small (tiny people) things distracted me. I won’t go back to explaining the whole thing again now, but one thing missing on the blog is the colour magnitude diagram which demonstrates how we shifted through thousands of galaxies (with your help) to find just 294 truly red, disc dominated and face-on spirals. 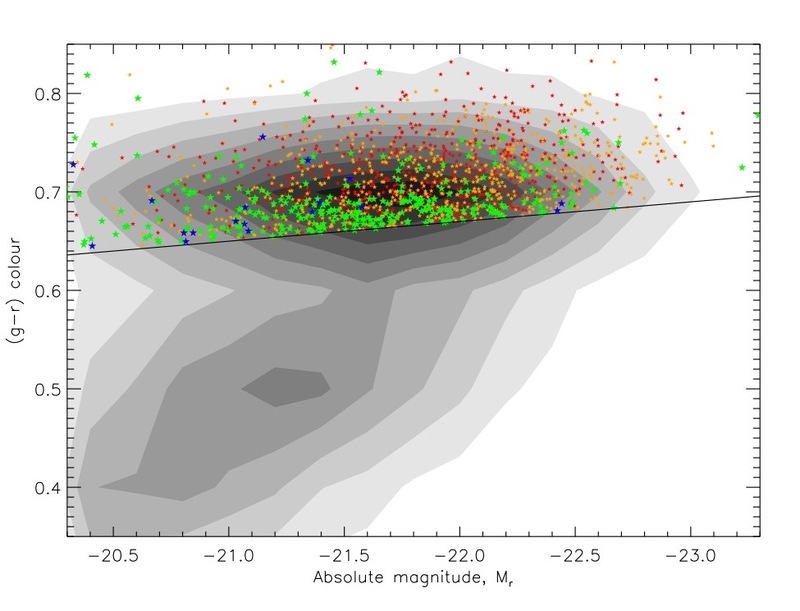 A colour magnitude diagram is one of the favourite plots of extragalactic astronomers these days. That’s because galaxies fall into two distinct regions on it which are linked to their evolution. You can see that in the grey scale contours below which is illustrating the location of all of the galaxies we started with from Galaxy Zoo. The plot shows astronomical colour up the y-axis (in this case (g-r) colour), with what astronomers call red being up and blue dow. Along the x-axis is absolute magnitude – or astronomers version of how luminous (how many stars effectively) the galaxy is. Bigger and brighter is to the right. So you see the greyscale indicating a “red sequence” at the top, and a “blue cloud” at the bottom. In both cases brighter galaxies are redder. The standard picture before Galaxy Zoo (ie. with small numbers of galaxies with morphological types) was that red sequence galaxies are ellipticals (or at least early-types) and you find spirals in the blue cloud. The coloured dots on this picture show the face-on spirals in the red sequence (above the line which we decided was a lower limit to be considered definitely on the red sequence). The different colours indicate how but the bulge is in the spiral galaxy – in the end we only included in the study the green and blue points which had small bulges, since we know the bulges of spiral galaxies are red. These 294 galaxies represented just 6% of spiral galaxies of their kind. So this is one of my favourite versions of the colour magnitude diagram. It’s a mushroom! Perhaps the one the caterpillar sat on, smoking his hookah, as he chatted with Alice?